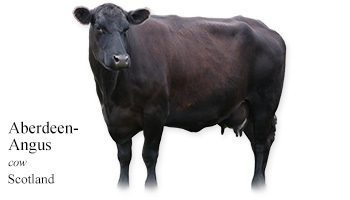 The Aberdeen-Angus had many important breeders during the late 18th and 19th centuries. In particular, there was the Watson family, who started their breeding of Angus cattle in 1735. And, from this family, it was Hugh Watson who became the most important founder of the breed because he started his Aberdeen-Angus herd in 1808 and kept it virtually free from outside blood for almost 50 years. He named his best bull ‘Old Jock’ and his best cow ‘Old Granny’. Old Granny lived 36 years and had 29 calves. My Daily Cow® Scotland and read about other Scottish cattle breeds.